There is a 50 Meter, 8 lane heated outdoor pool, and an indoor 6 lane 25 yard pool. A pool will be a available for warm-up and warm-down throughout the meet. Eligibility: Open to all PVS registered athletes and invited USA Swimming athletes. Contestants must have equaled or bettered the applicable cut-off times. Entry times and USA Swimming memberships are subject to confirmation. NOTE: Entries for the 13-14 and Senior 50 Backstroke, 50 Breaststroke, and 50 Butterfly will accepted from any swimmer who has already qualified for either the 100 or 200 event in the respective stroke. Current USA Swimming Rules shall govern the meet. All events are timed finals. A contestant may enter no more than four individual events per day and no more than seven individual events for the meet. PVS Scratch Policy will be enforced. Athletes who have not checked in prior to the specified time will be scratched from the event. Athletes who have checked in, have been seeded, and fail to swim the event will be barred from their next scheduled individual event. Coaches are expected to be in compliance with the new USA Swimming Background Screening Program. Inclusion Policy for Swimmers with a Disability PVS and host clubs along with their Meet Directors are committed to the Inclusion Policy as adopted by the BOD . Athletes with a disability are welcomed and are asked to provide advance notice of desired accommodations to the Meet Director and PVS Age Group Chairman (Bill Marlin at coach_bill@verizon.net ). The athlete (or the athlete’s coach) is also responsible for notifying the session referee of any disability prior to the competition. Meet management will distribute positive check-in sheets to each club for each of the sessions being checked-in.. Coaches for each club are responsible for completing the check-ins for their club by the appropriate deadline and turning them in to Mark Eldridge. 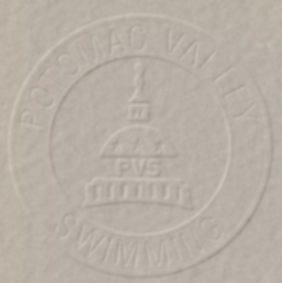 Warm-up:	 The prescribed Potomac Valley warm-up procedures and safety policies will be followed. Timers:	 Clubs will be responsible to provide their fair share of timers, and will be assigned lanes by the meet manager. Officials: All certified officials wishing to volunteer to work this meet please contact the RMSC Officials Chairman, Jim Garner at 301-977-1222 or email garner@garnerjim.net prior to May 22. Please include your club affiliation, certifications held, and sessions you wish to work. Officials volunteering should sign in at the recording table prior to the start of Warm-ups. Certified officials who have not previously advised of their availability may volunteer their services to the Referee at this time. Age-Group: High point awards for first place and runner-up in each age-group. No more than 2 relay teams may score for each club in each event. Supervision: Coaches are responsible for the conduct of their swimmers, both at the meet and in the warm-up/warm-down area. Inappropriate behavior will be cause for suspension from the meet and the Rockville Swim Center facility. Admission:	 There is no admission charge. Each team is requested to remit one check to cover the entry fees for the entire team. Please do not send cash. Entry fees are due with entries. Warning:	 Any club that enters an unregistered athlete, falsifies an entry in any way, or permits an unregistered coach to represent them, will be fined the sum of $100.00, and no further entries will be accepted from the club until the said fine is paid. Entries: Computer disk entries (Hy-Tek) require a meet entry report by SWIMMER and a meet entry report by EVENT from Team Manager. Also submit a competed "Entry Cover Sheet". Signature and phone number of club official must be included with the entry. Meet director reserves the right to limit entries. NEW: All Relay-only swimmers must be listed on the meet entry in order to participate in the meet. Optional: Before preparing your entries, events for this meet can be downloaded and then imported into team manager (download "44mm060107.zip") unzip it and then go to team manager/file/import/meet events). To download as a file, you may need in Netscape to right click on the mouse and select "Save Link as" and with Microsoft Explorer right click on the mouse and select "Save Target As" Special Note: Meet QT's shown in this file are SCY as they are conforming entry times for this meet. Entry Times:	 Short course entry times will be considered conforming times for this meet. Long course entry times must be designated with a capital letter "L". These non-conforming times will be seeded after short course times. Entries that are not submitted on the required forms, are not complete, or are not legible, will not be accepted and will be returned. The Meet Director will not be held responsible if there is not time to properly resubmit the entry. Do not enter with a time achieved prior to May 22, 2005. Deadline:	 All PVS entries will be accepted until Tuesday, May 15 at 6:00 pm. After that, all entries both PVS and non-PVS will be handled on a first-come, first-served basis until the entry deadline of Tuesday, May 22, or until the meet fills to capacity. It is strongly suggested that all PVS teams get their entries in by May 15. Non-PVS teams should submit entries as early as possible. This meet will fill to capacity. Important: The above dates are the deadlines for clubs to submit their entries to the Meet Director. Therefore, clubs usually set an earlier deadline to receive entries from their swimmers. Check with your club for this information. Make Checks Payable to: RMSC Parents' Club, Inc.
# Use 500 yard freestyle short course times - Verification of time required with entry. * Swimmers must have achieved the meet QT for the 100 or 200 in this stroke. Please enter using 50 times. * Swimmers must have achieved the meet QT for the 100 or 200 backstroke. Please enter using 50 times.